Our martial arts club based in LUTON, is one of our group’s Newest and most exciting schools. 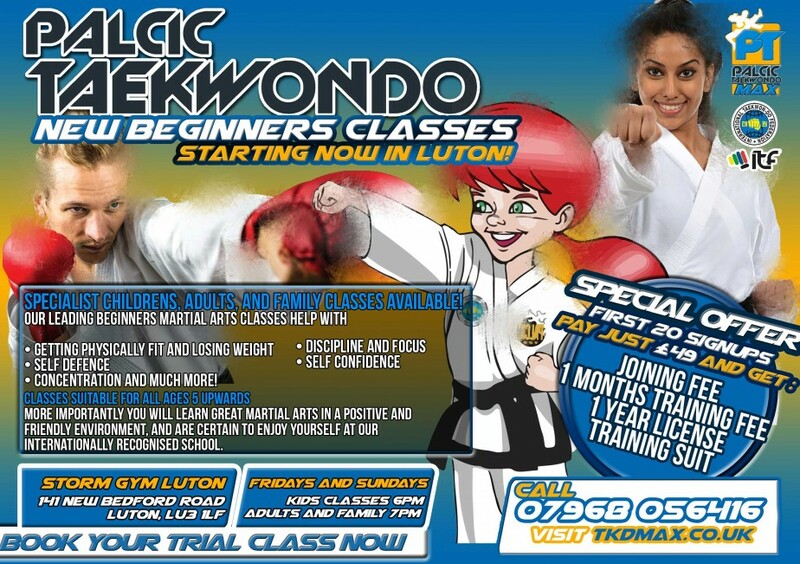 RECENTLY OPENED UP IN LUTONS STORM GYM This school brings Palcic Taekowndos Distinctive and outstanding Syllabus to Luton! We have tailor made children’s martial arts classes, which are perfect for the younger kids. Our beginner’s classes are suitable for the complete novice, who has no previous experience in martial arts, and are a great way to get fit, lose weight, and increase confidence, whilst learning from some of the top instructors in the area. The school is run by one of our senior ranked instructors Mr George Palcic 3rd degree black belt, and his team of assistant instructors, who are always ready to give that extra bit of help you need. The school is affiliated to the ITF – INTERNATIONAL TAEKWONDO FEDERATION. This is the world’s foremost, original, and most authoritative taekwondo body. The club therefore comes with genuine credentials which you will find very hard to match. And you can be certain that the grades and qualifications you receive at the school will be amongst the most recognised in the world.